IAG produces IAG Breakfast Briefing – a daily email newsletter sent to around 20,000 inboxes at 8am Macau time each weekday. Served piping hot with two cups of coffee each morning, IAG Breakfast Briefing contains the four or five biggest industry news stories of the day, In Brief stories, iGaming news, industry videos, up to date gaming industry stock prices and a list of upcoming industry events. IAG Breakfast Briefing is where the Asian gaming and hospitality industry turns each and every morning for the news of the day. Click here to subscribe for free to IAG Breakfast Briefing. In January 2019 Inside Asian Gaming launched IAG Japan to cover the burgeoning Integrated Resort industry in Japan. 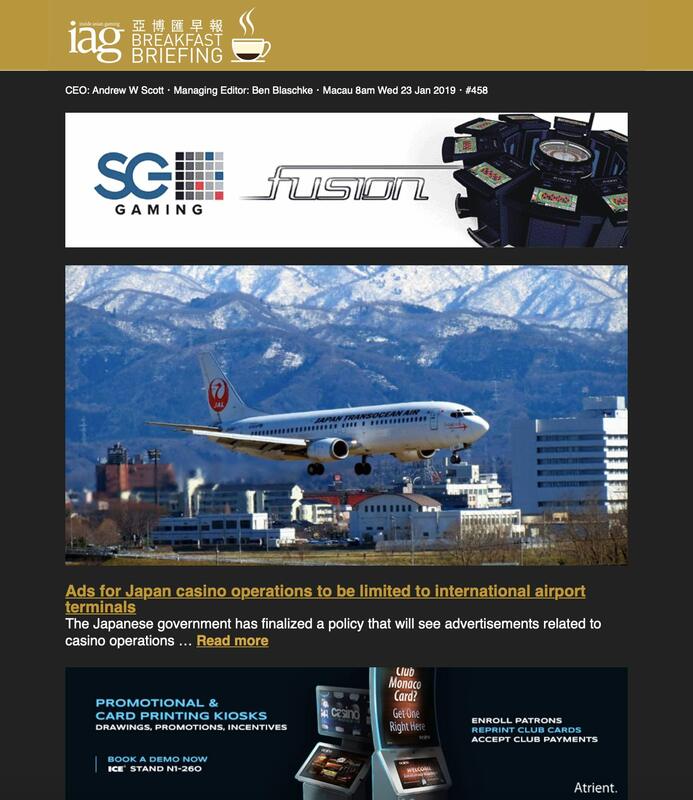 This included the launch of our Japanese language daily e-newsletter titled IAG Daily Briefing, which is sent to key executives connected to the Japan Integrated Resort industry at midday Tokyo time each weekday and includes articles of specific interest to the Japanese industry as well as industry articles from around the region and the world. Click here to subscribe for free to the Japanese language IAG Daily Briefing.